The Tories’ support for Britain’s arms industry means it is “complicit” in human rights abuses, Jeremy Corbyn will say today in a landmark speech at the United Nations. The Labour leader will highlight the export of British arms to Saudi Arabia, and their subsequent use in Yemen, in a wide-ranging intervention in which he will also attack “grotesque” levels of inequality and tax avoidance. 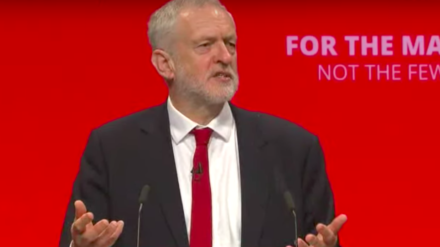 In one of the most high-profile speeches since he rose to the top of the Labour Party, Corbyn will pick out four threats to common humanity – the concentration of “unaccountable” wealth in the hands of a corporate elite, climate change, the refugee crisis and a “bomb first, think later” approach to tackling conflict. He will also set out how Labour would tackle the crises and he calls for Britain’s foreign policy to be determined by “international co-operation, solidarity and collective action”. Corbyn was a repeated critic of tax avoidance while a backbencher, and has continued to be so as Labour leader, but it is his return to the subject of the Saudi intervention in war-torn Yemen that are likely to prompt most attention. Days after delivering an impassioned defence of Britain’s spending on international aid, he will say this country’s support for development in Yemen is dwarfed by the proceeds of its arms sales to Saudi Arabia. “While the British government champions some human rights issues, on others it is silent, if not complicit, in their violation. Theresa May turns a wilfully blind eye to the flagrant and large-scale human rights abuses now taking place in Yemen, fuelled by arms sales to Saudi Arabia worth billions of pounds,” he will say. “Total British government aid to Yemen last year was under £150m, less than the profits made by British arms companies selling weapons to Saudi Arabia. What does that say about our country’s priorities, or our government’s role in the humanitarian disaster now gripping Yemen.